this weather station will provide various weather information and weather forecasts. values sampled by the various weather station sensors. the included La Crosse Alerts Gateway. * There is no app or software to install. connected features at this time. transmitters; follow the climatic variations in real-time! Set and Activation Card is not required. There is no app. or software to install. connect the outdoor sensors to the display. Wireless Weather Station Information & Manuals: www.lacrossetechnology.com/support. IE8 or later, Chrome 12 or later, Firefox 12 or later; or Mac OS X 10.6 (or later): Safari 5 or later. may require vendor service fees per message (consult the terms of your device’s message plan). the weather station. Only use Alkaline batteries, rechargeable batteries may not work. STEP 1: Complete initial setup on a table with all components within 10 feet of each other. sure the lights are on in the setup room and the solar panel is facing a 60W light bulb or brighter.  Ensure the solar panel is not covered, and then remove the black protective foil on the solar panel. Remove the tape covering the reset hole. STEP 3: Insert two "AA" size batteries into rain sensor with correct polarity.  Insert two "C" size batteries into the thermo-hygro sensor with the correct polarity. Note: Allow all sensors to run for two minutes before inserting batteries in the weather station.  Insert three "C" size batteries into the wireless weather station with the correct polarity. transmission was successful. A wind speed or rainfall amount that reads "0"
minutes for the rain sensor. If not successful within 4 minutes, the thermohygro sensor will stop looking for the other sensors. STEP 6: Set Time and Date. See “Program Menu” below. procedure again at Step 1.
o Mode 1: "Wind speed + 24 hr. pressure history graph"
o Mode 2: "Gust + 72 hr. pressure history graph"
corresponding icon will be switched on. (If not successful, the icon will not be shown on the LCD). of the icon shows that a reception is in process. Press and hold the SET button for 3 seconds to enter the SET mode. Note: The display will automatically return to Mode 1 display in 30 seconds if a button is not pressed. 3. Press the SET button to confirm and to enter the MANUAL TIME SET. 1. The hour digit will flash. 2. Press the ▲/DATE button or ▼/RAIN button to set the hour. 4. Press the ▲/DATE button or ▼/RAIN button to set the minute. 1. The "12h" or "24h" digits will flash. 2. Press the ▲/DATE button or ▼/RAIN button to toggle the value. 3. Press the SET button to confirm and to enter the DATE SET. set the year. The range runs from "00" (2000) to "99" (2099). 2. Press the SET button to confirm the year and enter the month setting. 3. Press the ▲/DATE button or ▼/RAIN button to set the month. mode. The date digit will flash. 5. Press the ▲/DATE button or ▼/RAIN button to set the date. The temperature can be displayed in °F or °C (Default °F). 1. The temperature unit will flash. 3. Press the SET button to confirm and to enter the WIND SPEED UNIT. 2. Press the SET button to confirm and to enter the RAINFALL UNIT. The rainfall unit can be set to read in inch or mm. The default unit is inch. (hectopascal). The default unit is inHg. buildings, airport). The default reference pressure value is 29.91 inHg. of 27.17 to 31.90 inHg (920 to 1080 hPa) for a better reference. 1. The current relative pressure value will flash. holding the button will allow the value to increase faster. 3. Press the SET button to confirm and enter the WEATHER TENDENCY SENSITIVITY. numbers (.12) for dry areas like the desert. The default value is 0.09 inHg. The sensitivity value will flash. Press the ▲/DATE or ▼/RAIN to select the value. .27 inHg (3hPa to 9hPa). The default value is 0.15 inHg. 1. The sensitivity value will flash. 2. Press the ▲/DATE button or ▼/RAIN button to select the value. 3. Press the SET button to confirm and to enter the STORM ALARM ON/OFF SET. (AON) or Off (AOFF) (Default OFF). 1. The digit "AOFF" will flash. 2. Press the ▲/DATE button or ▼/RAIN button to switch the alarm On or Off. equivalent to 0° on the compass. The default setting is compass directions. 1. The wind direction will flash. out and returns to the Mode 1 display. FACTORY RESET PROCEDURE. SEE WARNINGS in the FACTORY RESET section. 1. "rES oFF" will flash. 2. Use the ▲/DATE button or ▼/RAIN button to select "rES Lo". 4. Follow the instructions at www.lacrossealerts.com to reregister the weather station online. memory and return the weather station’s settings back to the factory defaults.  Simply wait 30 seconds until the SET mode times out and returns to the Mode 1 display. thermo-hygro sensor and require the all sensor connections to be re-established. 5. "rES oFF" will flash. 6. Use the ▲/DATE button or ▼/RAIN button to select "rES ALL". 7. Press the SET button to confirm and a countdown timer will begin counting down from "127"
When the timer displays "dOnE", you must remove the batteries from the display for 10 minutes. 10. Wait 5 minutes for the outdoor weather data to display. 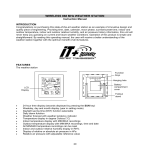 If any of the outdoor data displays "--"
in the Quick Setup Manual included with the product. disabling the low alarm (i.e. temperatures <14°F won’t trigger alarm, but temperatures >+104°F will). the value will blink, along with the corresponding icon ("HI AL"/ "LO AL"). Press any button to stop a ringing alarm. The high and low alarms can be switched On/Off independently, according to the need. advance to the next weather alarm section. Note: The storm alarm is set in the program menu. 1. In the normal display mode, press the ALARM button once. The highpressure alarm display will show. value. Hold the arrow button in to change the value faster. 4. Press the ALARM button to confirm the setting. The digit will stop flashing. 6. Press the ALARM button once. The Low Pressure alarm display will show. 9. Press the ALARM button to confirm the setting. The digit will stop flashing. the alarm is switched on. 11. Press the ALARM button to move to the indoor temperature alarms. 1. The high indoor temperature alarm display will show. temperature alarm value. Hold the button in to change the value faster. that the alarm is switched on. alarm value. Hold the arrow button in to change the value faster. 9. Press the ALARM button to confirm the setting. 11. Press the ALARM button to move to the indoor humidity alarms. 1. The high indoor humidity alarm display will show. icon indicates the alarm is on. 11. Press the ALARM button to move to the outdoor temperature alarms. 1. The high outdoor temperature alarm display will show. temp alarm value. Hold the button in to change the value faster. indicates that the alarm is switched on. 9. Press the ALARM button to confirm the setting. The digit will flash. indicates the alarm is switched on. 11. Press the ALARM button to move to the outdoor humidity alarms. 1. The high outdoor humidity alarm display will show. 11. Press the ALARM button to move to the wind gust alarm. 1. The wind gust alarm display will show. 6. Press the ALARM button to move to the wind direction alarm. Multiple wind direction alarms can be set simultaneously if desired. 1. The wind direction alarm display will show. selected wind direction alarm. The arrow icon inside the compass circle will disappear. ▼/RAIN button to move the wind direction alarm pointer to the next desired setting. direction alarms as you desire. 8. Press the ALARM button to confirm the setting. The digit will stop flashing. 10. Press the ALARM button to move to the 24-hour rainfall alarm. 1. The 24-hour rainfall alarm display will show. 6. Press the ALARM button to exit the alarm setting mode. can be produced again. Hysteresis values for the various weather data types are given in the table. Hold the ▼/RAIN button until the station beeps to resync with the gateway. represent the change in weather. current pressure value becomes the new weather tendency reference. setting mode–see WEATHER TENDENCY SENSITIVITY in the manual settings above. pressure has dropped and the weather is expected to get worse but not necessarily rainy. Note: After set up, readings for weather forecasts should be disregarded for the next 48-60 hours. therefore result in a more accurate forecast. air-pressure when really it is due to the slight change of altitude. is increasing and the weather is expected to improve, but when the indicator points downwards, the airpressure is dropping and the weather is expected to become worse. in the weather will be cloud with rain icons since the indicator is pointing downwards. upward or downward tendency arrow will be displayed until the tendency changes again. The LCD shows the relative air pressure value and the air pressure history on a bar graph. Press the SET button to toggle between Mode1 and Mode2 of the display. down from the 0 hour. the weather is expected to get worse due to a drop in air pressure. existing graph is then moved one column to the left. readings for the next 48-60 hours should be discarded. Note: The bar graph will scroll right to left regularly to prevent LCD burnout. The 1hour, 24-hour, week, month or total rainfall measurement is displayed in the unit of inch or mm. For all measurements, it is important time and date are set correctly on your display. literally an ongoing “last 60 minutes” timer. measurement. It is literally an ongoing “last 24 hours” timer. from time of display set-up until you manually reset the total rain. time updated to current time. 6. Total rainfall with the date the rainfall total was last reset. Note: If the rainfall total has not yet been reset, "---. --. ---- will be displayed for the date. 1. Press MIN/MAX button to show the desired weather data. 2. Press ▲/DATE button. The stored value will be reset to the current value and current time. Note: Each MIN or MAX weather data value will need to be reset independently. accumulated since last reset of the total rainfall amount. be reset to 0, and the time is updated to current time. the higher the temperature, the lower the RH as more evaporation takes place. products, these conditions are a Temperature below 40°F and a wind velocity above 5 mph. A wind gust is a sudden, brief increase in the speed of the wind (less than 20 seconds) followed by a lull. This is different from a sustained wind. walls, floors, ceilings, etc.) will reduce the range. wireless weather station. See the Wireless Connection Diagram below. minimum mount height of 6 feet. weather data to the Internet. station or the sensors closer and wait a few minutes to see if the wireless reception icons display again. the reported wind direction will not be accurate. house. The roof may or may not be an ideal mounting location. sensor on a horizontal mast or surface.  Fasten the wind sensor to a suitable mast using the U-bolt, washers and nuts included. and charges the internal battery pack automatically. Note: Do not open the wind sensor. This will void the warranty. electrical grade metal or electrical grade PVC). thermo-hygro sensor and on the same side of the house.  Mount the rain sensor at least 6 feet off the ground and level for optimum wireless transmission.  The rain sensor should be accessible to allow for periodic cleaning of debris or insects.  To avoid frequent build-up of debris, do not mount the rain gauge too close to the trees or plants.  Remove the funnel portion (cover) of the rain gauge by twisting it firmly counter clockwise. gauge to mark the screw locations.  Drill a hole in the center of each marked location. each hole and use a screwdriver to gently snug the screws. Note: Do not over-tighten the mounting screws. winter. If stored for the winter, remove the batteries to avoid leakage. Be aware of other wireless rain gauges in the area that may cause interference. The thermo-hygro sensor is "weather resistant", but not "waterproof". elements at a minimum height of 6 feet. of the house to avoid the effects of sunlight. and snow may soak into the sensor and cause failure. for 2 seconds to synchronize the weather station to the sensors. The Professional Weather Station is free standing with the base stand or can be wall mounted. releasing the professional weather station. televisions, microwaves, routers, baby monitors, etc., which can prevent signal reception.  Be aware of electrical wires and plumbing within a wall. This will interfere with signal reception.  Obstacles such as walls, windows, stucco, concrete, and large metal objects can reduce the range. networking hardware may not work with your gateway. to computers on your home network. Gateway Set and Activation Card is not required. alerts. * There is no app or software to install. Always purchase the correct size and grade of battery most suitable for intended use. Replace all batteries of a set at the same time. Clean the battery contacts and also those of the device prior to battery installation. Ensure the batteries are installed with correct polarity (+and -). Remove batteries from equipment which is not to be used for an extended period of time. agents as they may mark the LCD and casings. Do not submerge the unit in water. by a qualified engineer. Opening and tampering with the unit may invalidate their guarantee. changes in forecasts and readings and thereby reduce their accuracy. responsible for damages to persons or property by service use. wild country and/or in unauthorized grounds strongly damages the environment. recycling and recovery of the electrical and electronic waste. consequences that occur should an inaccurate reading take place. This product is designed for use in the home only as indication of the temperature. This product is not to be used for medical purposes or for public information. The specifications of this product may change without prior notice. This product is not a toy. Keep out of the reach of children. No part of this manual may be reproduced without written authorization of the manufacturer. product relating to manufacturing defects in materials & workmanship. This device must not be co-located or operating in conjunction with any other antenna or transmitter. printing error, or their consequences. All trademarks and patents are recognized.